Introduced in 1983 the Kuggen shares the same ergonomic advantages of the earlier Terminal Table in that the sitters arms are rested comfortably on the table surface rather than on a chair. 1970’s Bruno Mathsson contemplated the advances in office technology and in 1979 he contacted the Danish Division of Hewlett Packard. 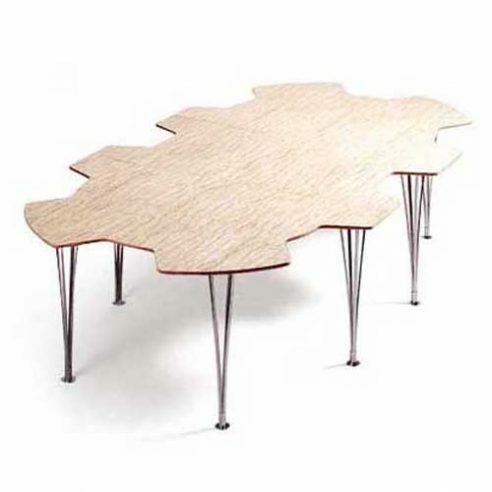 This led to his proposal for a computer workstation or Terminal table which he exhibited at the 1981 Copenhagen Furniture Fair. Mathsson placed the keyboard on an angled, sliding surface the front edge of which featured a space cutout for the sitter. This space Mathsson called the “stomach hole” .